We purchased Checkmate Farm in 2002. The farm is currently home to Karakul Sheep and other animals, which you can learn more about by visiting our Animals page. Located in the hills of Bluemont, Virginia, we enjoy a 50 mile view as we take care of our livestock and our 100 year old property. We are very blessed and hope this website adds to your own farming adventure. Since occupying Checkmate Farm, we have developed and maintained beautiful perennial gardens and moved several Karakul sheep, heritage pigs, and sheep dogs to the farm. As our farm grows, we continue to renovate the property and develop ways to enhance the lives of our animals. 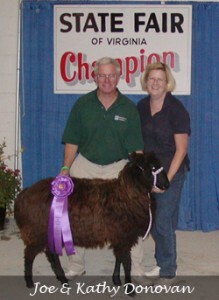 You can take home a piece of Checkmate Farm by purchasing our Market lamb or Wool products. In the 1940s, our farm was called “Twin Willows” and was a weekend home to Mr. & Mrs. Wilson. While occupying the farm, the Wilsons continued to add on to the 1890’s house. During the 1950s a colonel, responsible for “Mount Weather” called the farm home. In the 1960s, the farm was renamed “Checkmate Farm” by owners Mr. & Mrs. Verbonic. The Verbonics changed the name because this farm was to be their final move. Thus Checkmate!